"Now, from the Embo Toy Corporation, Subterano! Taking virtual entertainment to a new max!" When a film uses any type of so-called virtual reality as a plot device, no matter how minor, I generally cringe. Outside of a few well-placed examples (The Matrix and eXistenZ, while maybe not true VR, come to mind at least in spirit), most of the films fall into the usual quagmire that occurs almost anytime a computer is used as an on-screen tool. I still get woozy and slightly nauseous thinking about Michael Douglas in Disclosure, and that completely idiotic VR-database, a plot point that didn't even work that well in Michael Crichton's book, either. 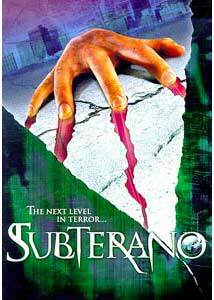 With the Aussie film Subterano, directed by Esben Storm, its a futuristic fascist-like world where a popular high-tech virtual reality video game (ironically called Subterano) takes full control of an underground parking garage populated by a handful of characters who find themselves having to play the game to stay alive. The group of unwilling players is led by escaped assassin Conrad (Alex Dimitriades) and his tough, independent gal pal Grace (Tasma Walton), along with a gaggle of expendable victims, including some day-glo punks (with Kate Sherman's retro Cyndi Lauper-ish Angie the most enjoyable), a Gestapo-like security guard, and an elderly man. Once the game locks them in the parking garage, the characters have to make their way through a number of levels (get it? just like a game! ), though none of them are really sure why, or how, for that matter. Whether for better or worse, there aren't a lot of flashy VR effects here; in fact, most of them look like nothing more than remote-control models. There are occasional shots of the deep-voiced EmboMan (dressed like a Cirque du Soleil reject), who is controlling the game, and he gets to utter some inane one-liners as he torments the players, but most of the film slyly focuses on the human characters moving from level to level in the parking garage, and them narrowly avoiding death from one of the game's killer machines. One of the recurring characters is something called The Messenger, which looks like an over-sized Tensor lamp with a face, on wheels, and its purpose is to apparently mock Conrad, Grace and the rest, all while supplying vague game play hints. On the plus side, Subterano features a wacky skull-faced, flame-throwing behemoth on roller skates that pops up in the last twenty minutes or so, and it gets to do some fun, low-budget Terminator 2-like regeneration. My biggest beef here is the undeniably bland hero, here played by Dimitriades, who is supposedly some type of unstoppable assassin for a group called Orphans of the Revolution. On paper Conrad could have been a formidable lead character; hell, by his own admission he started his massive killing spree when he was just four years old. Dimitriades, however, is left with little to do but walk around stoically and squint a lot. The real problem is the unfortunately flat character of Conrad is literally overshadowed by Tasma Walton's tough-as-nails Grace Stone, complete with her finger-less gloves, leather jacket and form-fitting Lara Croft top, to say nothing of her prowess with a knife. Walton's strong-jawed Stone acts more like a video-game heroine than Dimitriades does as the hero, and I think Subterano might have been more fun with her carrying the lead responsibilities. Image Transfer Review: Lions Gate has issued Subterano in a 1.33:1 full-frame presentation, and considering that this was originally a Showtime Australia production (and now straight to video) this is likely the only aspect ratio we'll see it in, so get over it. Despite its low-budget roots, the presentation is none too shabby, with the image transfer looking surprisingly sharp, with little in the way of defects or grain. Director Esben Storm has opted for that stylish futuristic blue hue in most of the shots, and though that technique has almost become a parody of itself, the minimalized color palette has an intentionally steely and drab look to it. The subdued colors really serve to accentuate Storm's sporadic use of brighter reds or greens, as with Angie's hair or Grace's Lara Croft-life undergarments. Audio Transfer Review: Subterano is issued with one of those better-than-average 2.0 surround tracks that pop up from time to time, one where the rears actually get noticeably used. This isn't overly aggressive mix, but there are plenty of music stingers and ambient sounds popping up from the back channels that fill out the presentation. I did notice that the dialogue was a little difficult to decipher at times, partly due to the Aussie accents. Subtitles would have been nice, but there are none. Extras Review: There is a short behind-the-scenes featurette (12m:55s) that begins and ends rather abruptly, that made me suspect it was once part of a larger piece. We get the usual snippets of what-it's-all-about dialogue from leads Dimitriades and Walton, as well as from the producers discussing character backgrounds and generally reiterating the plot. The segment wrap with a couple of special effects guys briefly showing how some of the computer animations were done. Overall, a bit on the light side, but it's always good to see Tasma Walton, if you ask me. The disc is cut into 23 chapters, includes a theatrical trailer, and does not feature subtitles of any kind. Subterano plays out like an extended Twilight Zone episode, and the usual drive-a-truck-through-them plot holes concerning virtual reality games abound here. Outside of a few opening scenes, the film is practically a one-set teleplay, taking place largely in an underground parking garage (or as the Aussies say, a "carpark") as the characters struggle to make their way from level to level without getting killed. In fairness to Subterano, I expected the worse (based on the god-awful trailer), and I did find the film to be significantly better than the preview. It isn't great, but it's tolerable low-rent sci-fi with a lot of horrible one-liners. The effects are kind of cheesy, but you have to just love Tasma Walton's leather-clad, knife-throwing pediatric nurse Grace Stone (who really should have been the lead here, damnit).